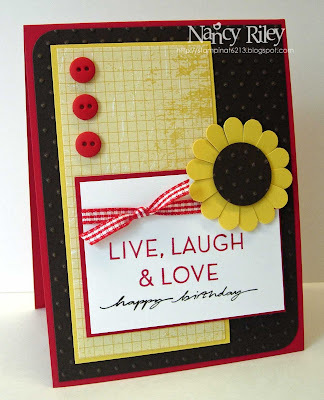 This simple card was i nspired by Colour Q Challenge #86 of Real Red, Daffodil Delight, So Saffron, and Early Espresso, and Sweet Sunday Sketch Challenge #119. I immediately thought of this sunflower card we made at a stamp class a couple of years ago when I saw the inspiration socks from the Colour Q. The sunflower is so simple to make - punch with the scallop circle punch, cut with scissors toward the center in each indentation. The center of the sunflower is made using the 1" circle punch. 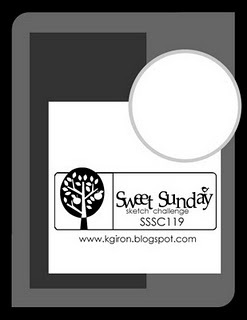 I have missed Karen Giron's Sweet Sunday Sketches - she designs THE BEST sketches, doesn't she?! 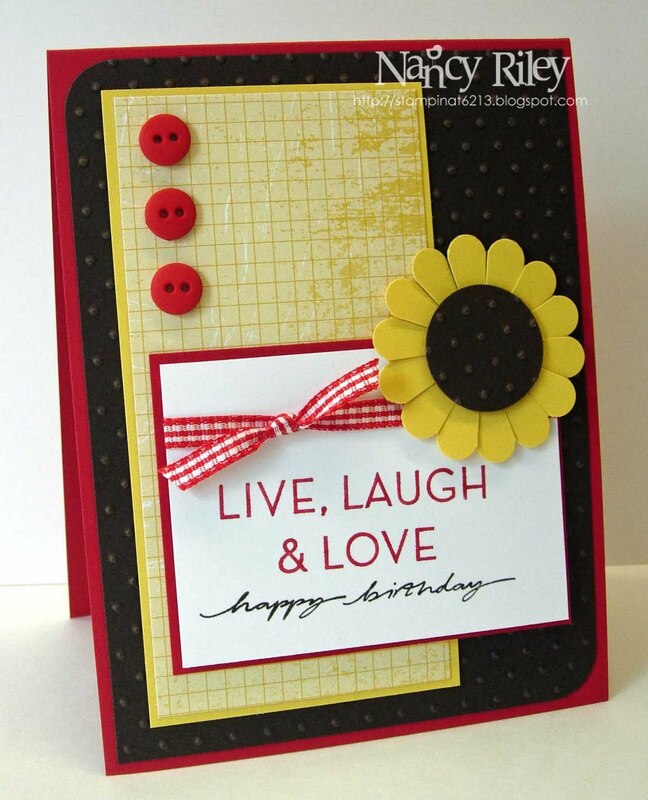 SO glad to see your wonderful stamped creations again!! And what a wonderful card it is, too! PERFECT take on the challenge! WOW you are on a ROLL! Great card Nancy! You're a NATURAL and always have stop me in my tracks cards! Happy Memorial Day! Such a CuTe card!! Really made me smile :) Great colors! Glad to see you back up and running - love to visit! Love it!! love the color combination and your take on the sketch. I am a daily blog reader! This is wonderful Nancy! I love the cute sunflower! It's so great to see you stamping again! Nancy, I wish you had posted to the ColourQ blog! YOur card is so beautiful and Happy! PLay with us this week, they are also happy colors! Thanks for being such a big part of the blog community! I love to look at the picks on your blog. 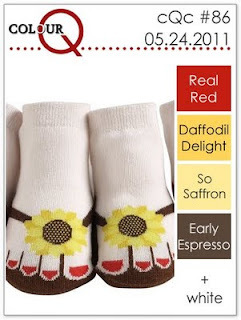 I llok forward to seeing your card at the ColourQ soon. Oh my! I adore this card! Super take on the challenge!! Oh how I've missed your wonderful cards! Always so eye catching! LOVE what you created from that inspiration...it's PERFECT!! !